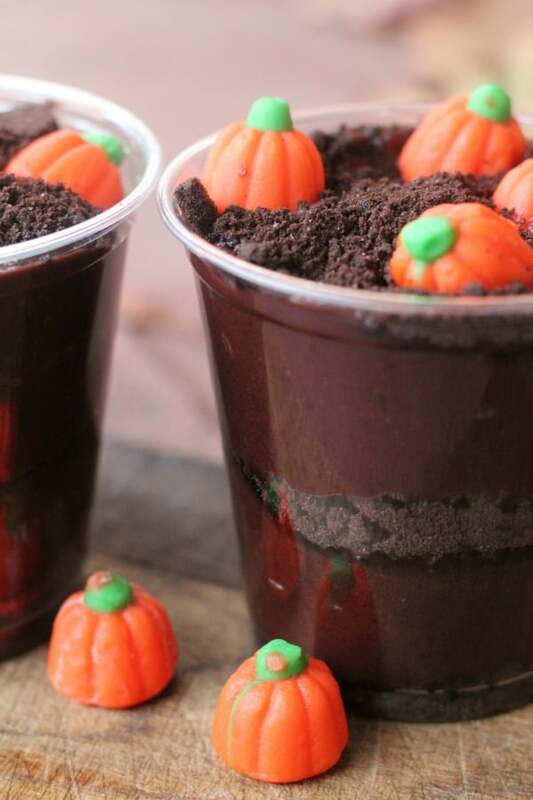 These easy pumpkin patch dirt cups are a fun fall or Halloween treat for children’s parties. You can make them up in just a few minutes and then keep them in the refrigerator until you are ready to serve them. Remove all of the frosting from the Oreos. I just used a table knife to scrape it off. There is no need for double stuffed Oreos for this recipe, because you are just going to remove the frosting. Place the cookie pieces in a gallon sized ziploc bag and crush them with a rolling pin. Next make the pudding according to the package directions. Let the pudding sit in the refrigerator for a few minutes to set. Place a thin layer of crushed cookie crumbs in each cup. This recipe will make about 5 servings. Place a couple of spoonfuls of chocolate pudding into each cup, so that the cups are about half full. Smooth the top of the pudding with the back of your spoon. Pour another thin layer of cookie crumbs on top of the pudding. 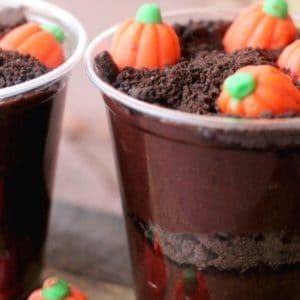 Fill the remainder of the cups with chocolate pudding. Sprinkle the remaining cookie crumbs on top. That’s it! These are really fun to make and my family loved them. The Hershey brand of chocolate pudding does not contain any milk in the mix, so if you prepare the mix with lactose free milk, this recipe can be completely lactose free! Like this recipe? For an easy pumpkin craft, try my candy corn painted pumpkin. You might also like this recipe for crock pot pumpkin spice latte.